The grass is still green here...when it is visible. We have had two rather small snow events and right now there is no snow left on the garden. The witch hazel is 'last man standing' so to speak. This native, Hamamelis virginiana, has a very long bloom span. It takes little notice of the cold and continues to add a bit of brightness to the dulling landscape. I have been puttering a bit outside. Last week I planted garlic and raked the final drops from the oak trees. I also pulled all but two containers inside. Most of them I empty, sort and stack. There are a few I drag into the barn and put them under lights where they remain all winter. 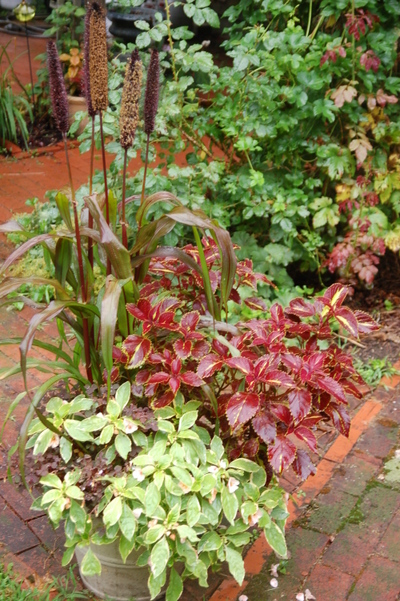 Two large cordylines are in there and a few more pots, two with dormant Eucomis in them. These plants would be expensive to replace and they do survive, if not thrive with this treatment. Since last week was Thanksgiving I hunted for material for an arrangement for the table and one for the wall in the bathroom. I managed to pull together assorted greenery and purple beautyberries but there was no real focal point so I purchased white alstroemeria. These flowers may come from a far away field but they do last quite a long time in an arrangement. I cheated with them just a bit. I am working at 'Slow Flowers'. I promise to write about that subject in the near future. 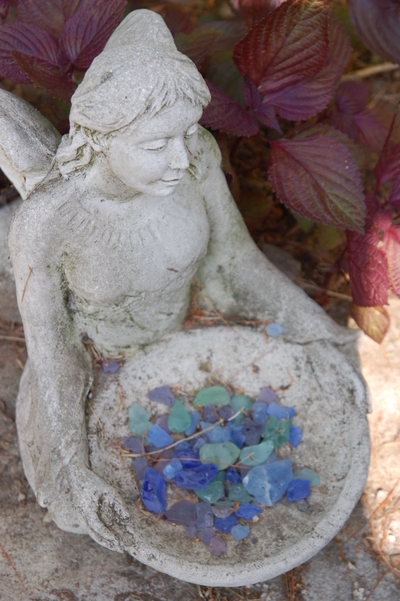 For now, enjoy the small treasures you find in the garden. They might be overlooked in the summer when color is abundant. Bronze fennel and black swallowtails, Foeniculum vulgare purpureum and Papilio polyxenes, go together like wine and cheese. Both groups are most welcome additions to the garden. 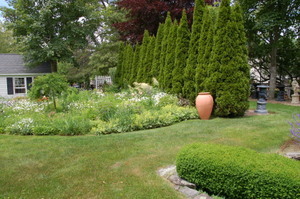 I added bronze fennel to both the long border and to a high, zinc container. 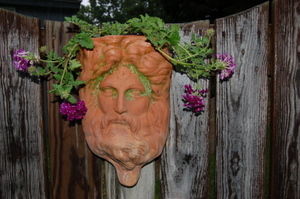 The container holds scented geraniums, dichondra and bronze fennel which gives height and color to the planting. It was placed next to the narrow walkway to encourage tactile guests to reach out and 'play' with the plants thus releasing a bit of scent. I may be the only one who actually does this on purpose. I never have been able to keep my hands to my self. It has been a great season for butterflies in the garden. There are many this year of all shapes and sizes and one would think they would be easy to photograph as they just flit from flower to flower but they are surprisingly shy and wiley. Capturing them in flight is a challenge. Not so these beautiful larvae. I counted six on the bronze fennel. They are quickly devouring this plant. I hope it provides enough food for them before they grow into adulthood. I do worry about them since their markings are so distinctive it would seem to make them easy prey for some scavenging bird. There are many birds here this summer as well. Indigo buntings, cardinals, tufted titmouse to name a few. That is a subject that deserves its own post. For now, it is time to enjoy the butterflies in all their stages. Are you seeing more butterflies than usual this season? The pineapple lily is a South African native which adds a thrill to any container planting. 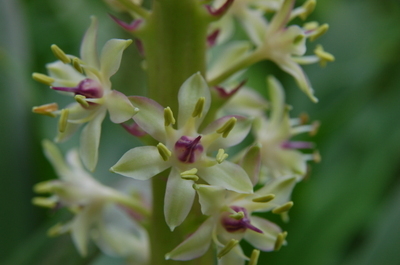 There are several different species of pineapple lily and over fifteen different cultivars. All have strap like leaves and a flower stalk which emerges from the center of the foliage. 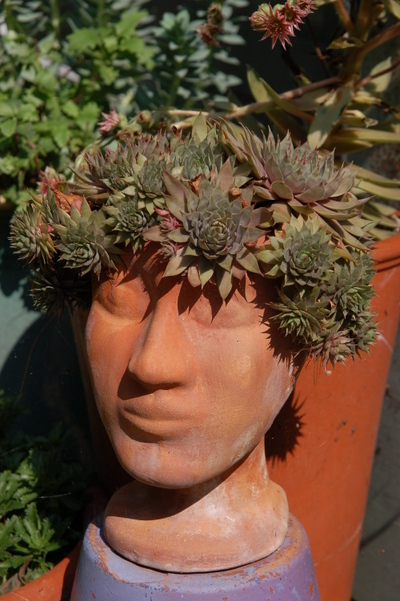 This is topped with a pineapple shaped flower composed of many small waxy florets. They are easy to grow and will grow in full sun or light shade although flowering is better in full sun. If I lived further south I would consider bedding them out for interesting texture in the borders. They are a bit pricey though and I hope to overwinter this one in the dormant state in a cool basement. We shall see what happens. I planted 'Sparkling Burgundy' in my containers near the house this spring. 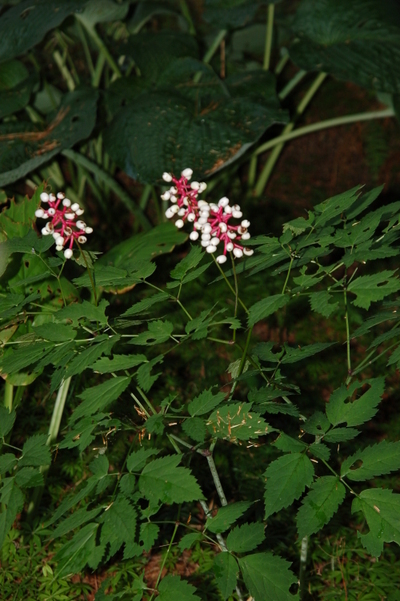 This cultivar has dark foliage and the flowers are creamy with bits of pink and yellow stamens. I have not detected any repulsive odor although, since it is pollinated by flies, it is said to have a bit of a stench. 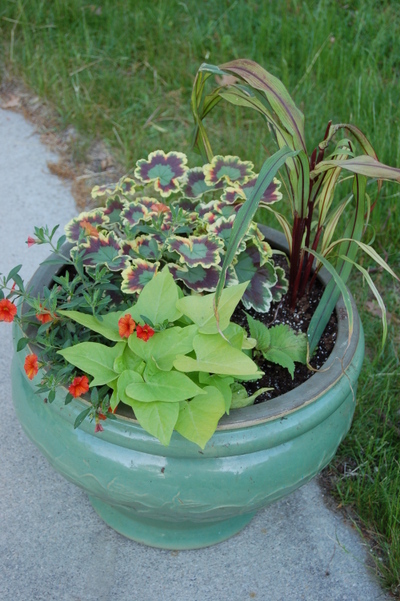 I am enjoying the tropical, exotic look it brings to these containers. In addition to the burgundy pineapple lilies in my container, a friend gave me a bulb which she had potted up from last year and overwintered in her basement. This lily has green foliage, a smaller flower head and interesting markings on the stem. 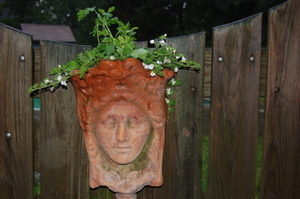 It looks quite nice on its own in the small clay pot on the patio and is also a reminder of friendship. Thank you Lois. 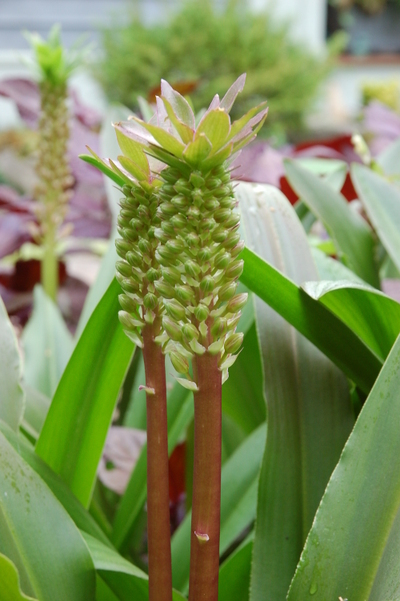 If you are looking for Eucomis bulbs, there are several on line sources. Mine was purchased as a potted bulb already showing promise. Now, a promise fulfilled. Have you grown this plant and, if so, what are your thoughts on Eucomis? There is quite a bit of moss at Ledge & Gardens. 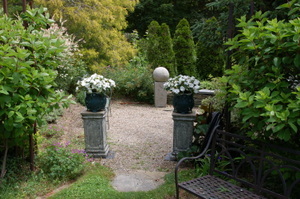 It covers the stone walls, permeates the lawn and sits at the base of the trunks of trees. I have always loved moss. As a child I would find a bed of moss and lie down on it never really minding the wet elbows and knees which inevitably resulted from such a moist, spongy bed. I have used it to line the fairy garden bench which started life with the name 'herb bench'. It is in a bit of shade so moss suits it better. The moss has also taken over the stone patio by the fish pond. This emerald green carpet glows in the low slant of the sun at this time of year. As golds turn to brown, green moss is a welcome addition to the landscape. It flourishes now with more moisture and lower light levels. Moss has gotten quite a bit more attention lately. 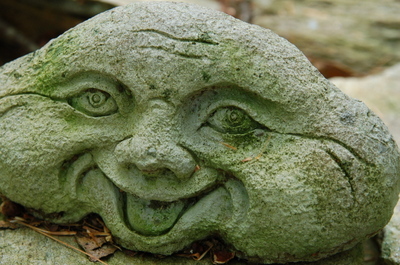 Moss & Stone Gardens is a wonderful website with great ideas on how to use moss in unique and interesting new ways. I recently cleaned out some of the urns for the season and since they are fiberglass and can withstand a freeze better than ceramic or clay, I decided to plant them with moss. The smallest one is cast iron. I love the soft look of the moss and probably should add some decorative elements. Any thoughts on that? 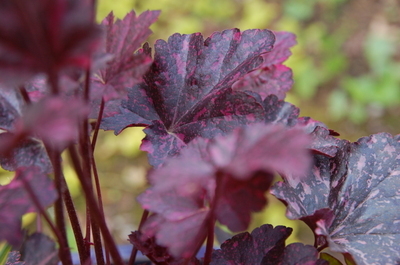 It is time to start potting up some containers and, if you are addicted as I am, it takes a bit of time so starting just a shade early with the less tender plants such as perennials helps with the time crunch to come. There always seems to be so much to do and not enough time in which to get all tasks done. The way of this world! The above containers were filled and planted with the hosta which I divided and the Lysymachia which also was stolen from a bed. 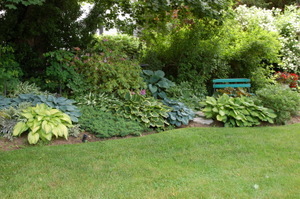 I will put a tender annual in as a filler under the hosta which has an upright form. 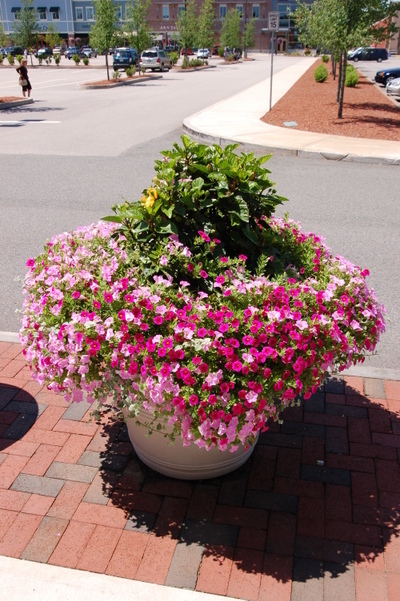 Perhaps one of the fusion impatiens will go in that spot. 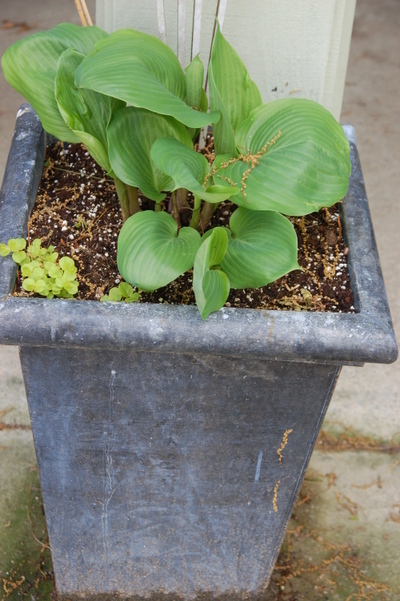 The middle pot has a Sum and Substance hosta in it and there is little room for underplanting with this one. We shall see what it looks like when it is fully expanded. 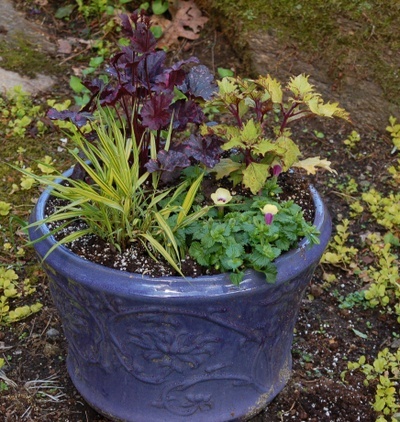 This purple container is in high canopy shade so quite a bit of light gets through although it gets little direct sun. 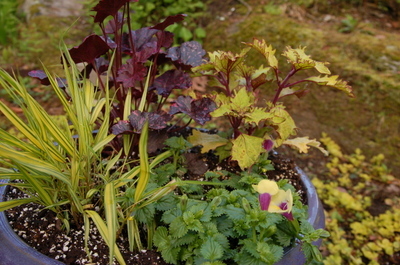 I chose a Heuchera m. 'Midnight Rose' for its' speckled foliage, Hakonechloa macra 'Aureola' for the spilling effect, Solenostemon 'Lemon Sunsation' for its lemon yellow foliage with purple stems and the little Torenia 'Yellow Moon' which also combines the purple and yellow. I like this combination and am looking forward to seeing it fill in. Elizabeth over at 'Gardening While Intoxicated' asked if anyone had tried any of these new Torenias yet. I have not used the Torenias before but this new one did catch my eye. I'm looking forward to seeing all of your container combinations. 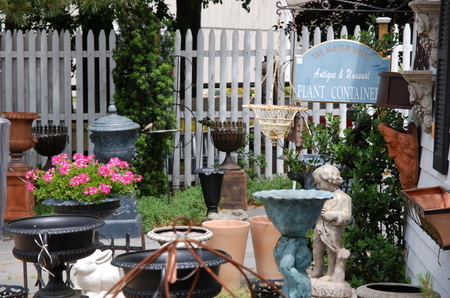 What is more fun than the endless plants, containers and colors we can put together. I doubt if any of us use the same plants or pots and that is what makes each container the creative effort of the gardener who puts it together. What are you potting up this week? 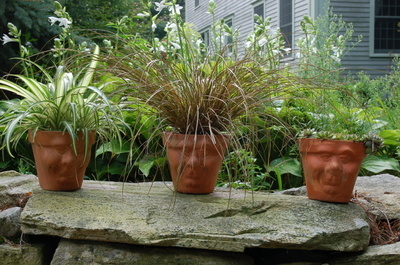 I have found that others enjoy face planters also. 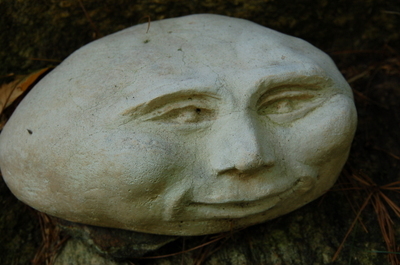 When visiting Minnechaug last week I found the following containers and sculptures. I'm not sure why I like the faces so much but they make me smile and that is always a good thing. 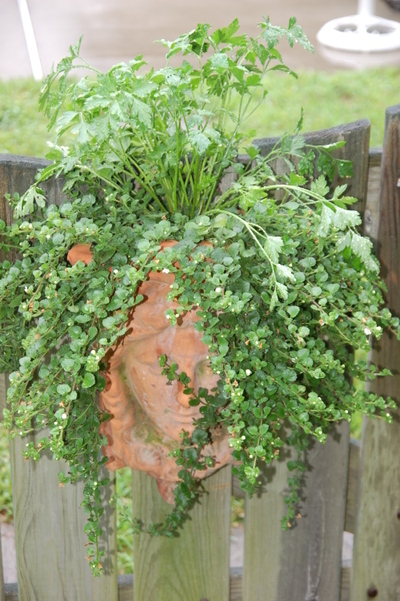 In addition to the face planters there were many plant combinations in the garden that are worth sharing. I love this picture of the Calla lily, Zantedeschia 'Schwartzwalter' with this morning glory which looks like Grandpa Ott. 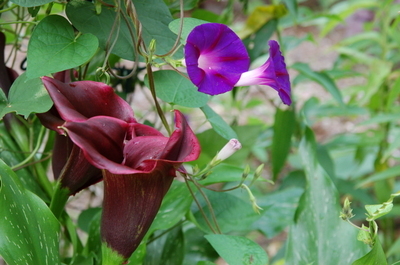 The stripe on the morning glory matches the color of the calla. The purple photographs a little more intense than it looks to the eye. 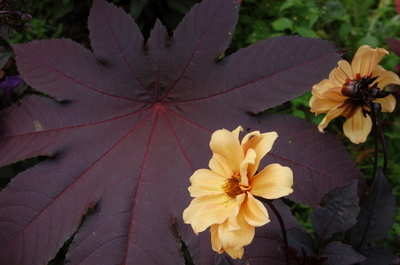 Here is a picture of Castor Bean with a dahlia. The dahlia has dark leaves and this butterscotch flower. There are several pineapple lilies, genus Eucomis, in the garden. I never noticed how lovely the flowers of this plant are close up. They are fairly small but profuse. Here is another interesting plant. This one is called doll's eyes, Actaea pachypoda. It is an interesting plant which produces white flowers in the spring and these berries in late summer. The berries are poisonous but they do look like doll's eyes. This is a member of the Ranunculaceae family and it is a native plant which grows in moist woodland soils. If you have space for a woodland garden this would be an interesting choice don't you think? 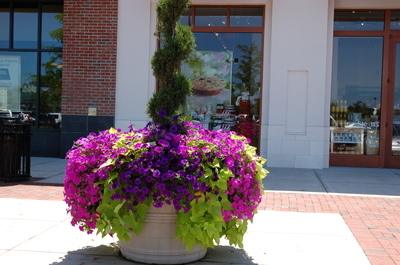 Last week I took some pictures on some really fabulous containers which are in an outdoor mall area in Hingham, MA. 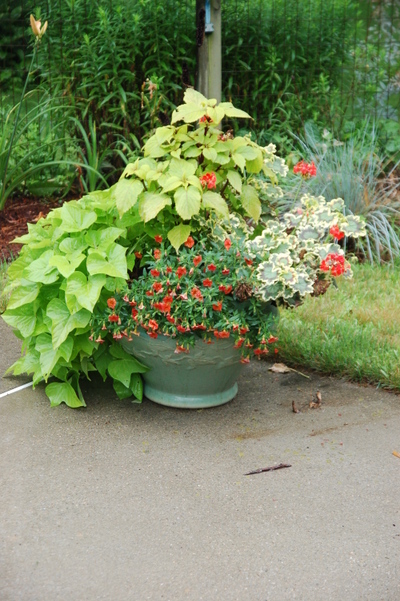 Each of the containers shown is about 36" across and stands as tall. 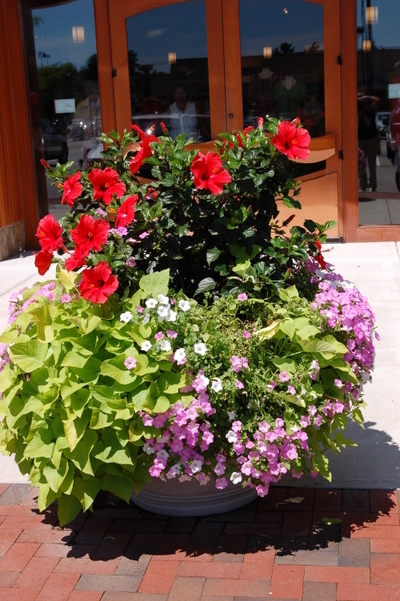 They are well maintained and are so much more interesting than just geraniums, the standard pot plant of the recent past. Not that geraniums aren't lovely, just overused. I hope you enjoy these containers! Here you can see how closely spaced the containers are along the roadway. 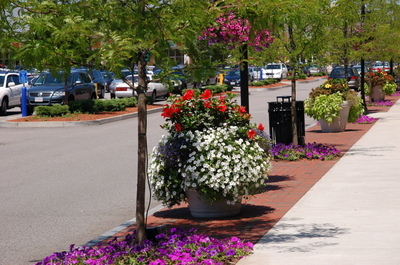 The use of this many varied containers creates a very pleasant shopping area. and a Bishop of Llandaff dahlia. They are also looking quite full. 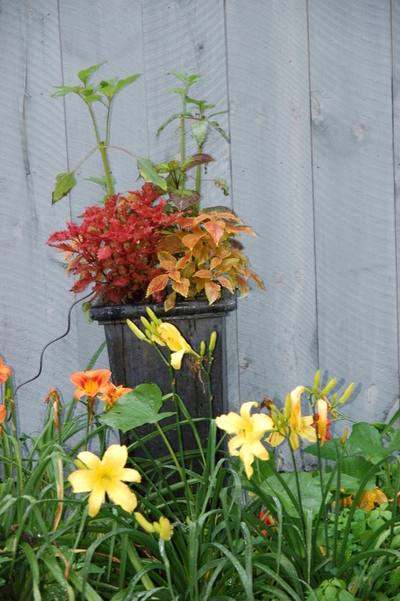 The barn has two large zinc containers and both contain sunflowers and coleus. The sunflowers are looking a bit stressed and I must have been a bit crooked today as the container seems to be leaning to the left. This year I decided to experiment with more foliage than flowers in the containers just to see how satisfying that could be. I think I like them but I will leave the vote to you. What do you think? Here are my head planters, Athena and Zeus, then and now. Here is one last container next to the house. 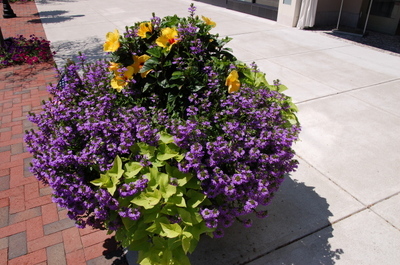 It also has millet and coleus with a yellow impatien and while it has a subtle monochromatic color it is pleasing to me. I thought that I should take the pictures this week as next week I will be away and the EM will be in charge of watering! We'll see if he can wield a watering can! Another day on the road and this time, off to Cape Cod. My first stop was at a pottery customer's establishment, The McCloud House. The McCloud House is located in Brewster, MA on Route 6A. 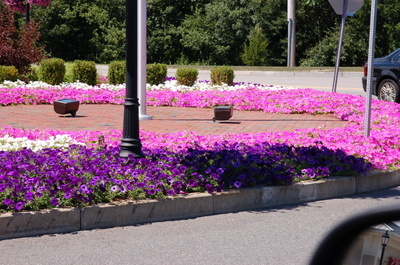 I sell different lines of Lawn and Garden products, at least, that is the goal, and I had not been here previously. 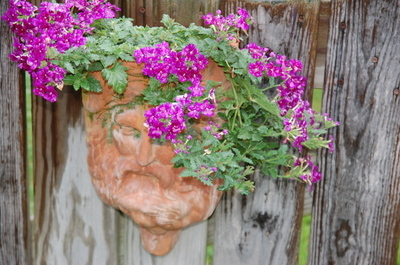 It is always a delight to discover a gardener in addition to a proprietor! The picture above shows a variety of different items, some I represent and some I don't but all are quite interesting wouldn't you say? This building houses antiques and collectibles but what is really interesting to me is that in the back, which is actually the backyard of the owner's home, is this beautiful display garden. Signs do invite the customers into the garden and I guess that means Sales Reps also. 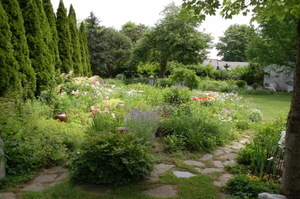 Here you see an overview of a portion of the garden with an abundance of perennials. 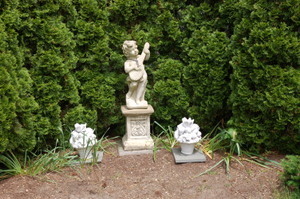 This is a picture of a well situated cherub playing his lyre or maybe just his banjo although that sounds like it is against angel rules. No banjos, too common! He is flanked by two fruit urns. I don't know why I really like fruit urns, but I do. I don't have a place to put any so I will have to enjoy them here. The cherub looks nice and cozy doesn't he? Just beyond is this entrance to a small courtyard. Who wouldn't want to step inside this portal? Inside there is a small table and chairs to the right. A nice place for a cup of tea or a glass of wine perhaps. 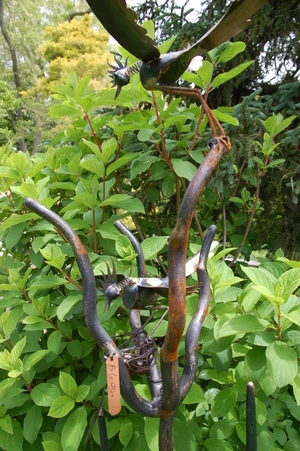 Moving along I encountered this metal sculpture featuring the bird family. Papa sits atop the stanchion while Mama feeds the babies. 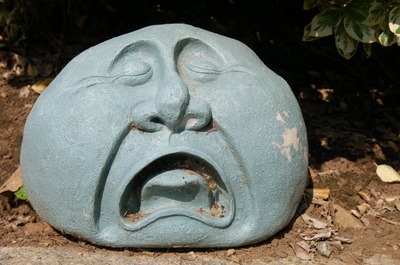 I like the organic look of this sculpture. You can't really tell from this picture that it is over six feet tall. Looking back toward the allee which I did not photograph is a focal point, this terra cotta jar. Who doesn't love terra cotta? Try to picture this scene without the jar. It is a vaguely disappointing image isn't it? 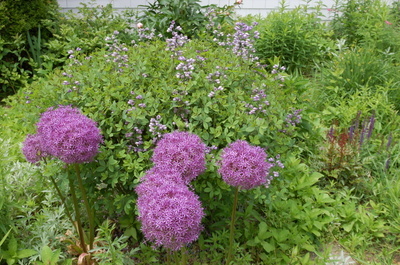 Next up are the biggest alliums I have ever seen. Allium 'Globemaster' is truly an 'Alice in Wonderland' flower. I guess they would look small next to the giant rabbit but only then. I think they are artfully combined in this echo color combination with the Baptisia. I think you need to click on this picture for a better effect. Guess what I have on my bulb list! Not one, not two, maybe seven? Who out there is growing this allium? This last picture is of the shade garden. 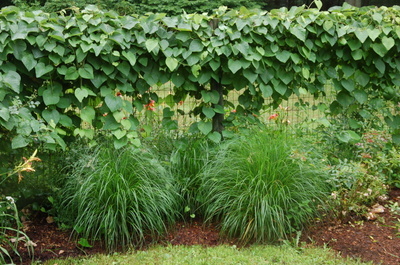 I have often heard some people say that they cannot garden because they have too much shade. Shade does not have to be boring does it! There is a serene beauty in the combinations of leaf textures and colors in this shade garden. Sometimes the surprises one encounters along the road are often the free bonuses of life! You can't really receive them if you don't move along the path and keep your eyes open. Once again, I thank you all for traveling with me.